Butterfly Reflections, Ink. : HAPPY HEART DAY! Hi friends!! It has been a little while since I've been on the BRI blog since my term ended in the summer of last year - first I can't believe that saying "last year" referring to 2017 has happened! So crazy!! Hope you all had a wonderful and joyous holiday season!! OK - back to my post for today - I wanted to create something for what seems natural for the next holiday - which is Valentine's Day. That is also crazy - time is super flying by!! 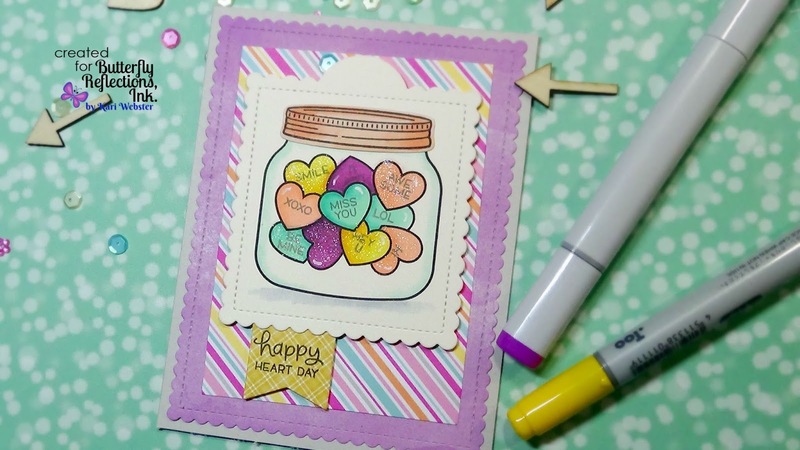 As soon as I saw the Valentine release from Lawn Fawn, I knew that a lot of it I wanted, and happy that I am able to share a project using some of those goodies today. 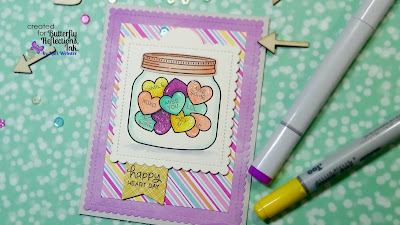 First - I die cut a scallop square tag from Pretty Pink Posh and I stamped out the jar image from How You Bean? stamp set with my Jet Black ink from Lawn Fawn - this ink is Copic Marker friendly. Then, I stamped the Conversation Hearts from the Add-on stamp set. From there, I just randomly chose soft colors that would represent these conversation hearts well, and colored them in quickly. Once I was happy with my coloring, I stamped onto the hearts some of the phrases that come in that same Add-on stamp set in Narwhal Ink which is a soft gray. I didn't want to stamp them in black and them look too harsh. I also added some shading around the jar for the look of glass as well as some shading at the bottom of the jar for some grounding. 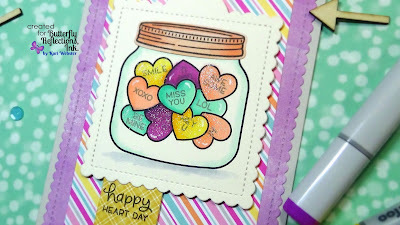 For the lid, I stamped the image onto a piece of Watercolor Wishes pattern paper, and added shading with the Peach colored Copics I used for the hearts, and then used the coordinating die to cut it out and added it directly on top of my jar. To finish up my card, I die cut some more pattern papers from MFT Blueprints 27, Hero Arts Infinity Rectangles, and also die cut a banner , and assembled it all together. 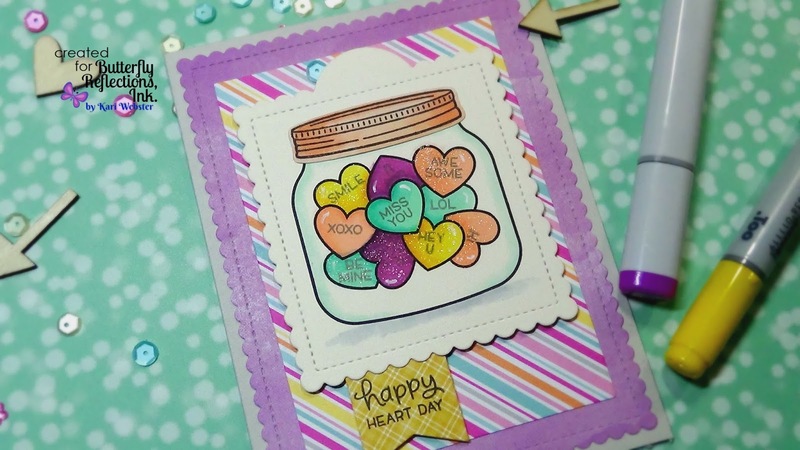 Before adding it to my card base I stamped my sentiment "Happy Heart Day" and then added foam adhesive to my focal images and adhered it to my other pattern papers. For final touches, I added some highlight accents with my white gel pen and also added some clear shimmer with my Wink of Stella shimmer pen. I hope this inspires you to start creating Valentine's Day cards :) Thank you all for taking time out of your day to visit, and I hope to be back soon!! Until then, Happy 2018!